Quads or inline skates will have you rolling merrily along after a little practice. Strap some wheels on your feet and hit the rink, road, velodrome or pavement -- for a skating workout, not a face-plant. Learn the basic steps to get rolling, and then practice, practice, practice to get your balance and solidify your technique. Chose traditional four-wheel skates -- quads -- or sleek, super-speedy inline skates; master the duck walk, and head for the Olympics. Don't forget your helmet. Get up from the ground -- good prep for the inevitable spill. Go to your hands and knees, and raise your right knee until it is almost in your right armpit. Shift your weight to this skate and, with both hands on the ground, stretch your left leg out straight behind you. Bring your left skate in next to your right skate and stand up, keeping both knees bent. Walk on your skates on real or artificial grass, shag carpet or another nonskid surface to find your balance. Move next to a good, flat skating surface and squat with your feet shoulder-width apart, arms in front of you, with a slight lean forward. You'll know you're in a low enough squat if your knee pads hide your skates when you look down. In the standing-squat position, bring your heels together, toes apart so your skates form a V. Step with one foot onto the rink or pavement. Bring your other foot up next to the first foot, in the V position. Keeping your toes pointed out and your knees flexed, take a step and then another step. The wheels are rolling, you're gliding a little, and you're staying low with knees bent so you aren't falling down. You're doing the duck walk, the prelude to actual gliding. Keep duck walking, lengthening your stride slightly as you gain confidence. If you forget to stay low or your feet just shoot out from under you, get back to hands and knees, tuck in the cannonball position and stand up, moving your feet back into a V.
Push down into the wheels and extend your stride to get more glide in that duck walk. Then start rolling on each stride, pushing off with one skate and gliding on the other. Raise the non-gliding skate off the ground so it won't drag and destabilize you. As you start to slow down, switch feet and keep gliding. Shifting your body weight and pushing down into the wheels will help you go faster. Once you become comfortable with the rhythm, glide to the right by leaning slightly in that direction. Stay in your squat and glide to the left by leaning to the left. Keep your arms tucked in with elbows bent, and pump them to increase your speed. Stopping on purpose -- while you remain upright and in control -- is an essential skill, with some variations between inline and quad skates. Rubber stops are located on the fronts of quad skates and on the back of the right inline skate. Some inline skates have stops on both skates. To stop while skating on quads, lift the heel of one skate and let the front stopper drag on the floor to slow your speed to a stop. 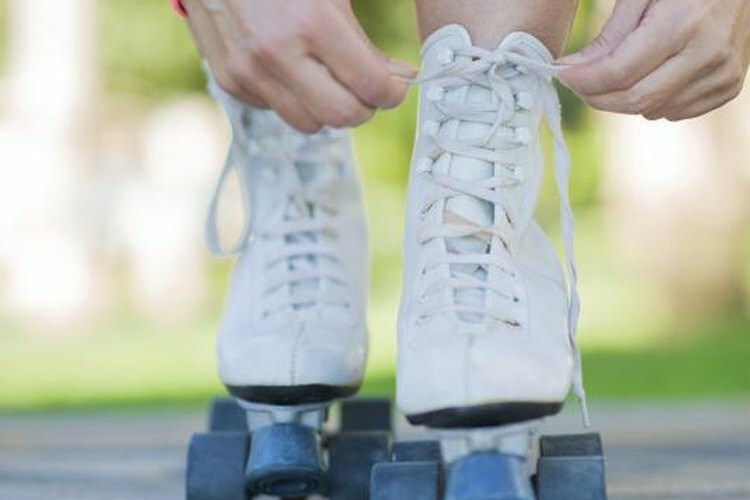 For inline skates, lift the toe of the right skate and lean strongly on the back stop to slow and come to a halt. Try a T stop -- rolling forward on two skates and then balancing on one while dragging the other at a 90-degree angle behind the rolling skate.